These bottles are what I got at Chiyomusubi! Would Tim’s audience at Anime Festival in New York be all over these bottles or what? Medama Oyaji is my favorite character from GeGeGe no Kitaro ! 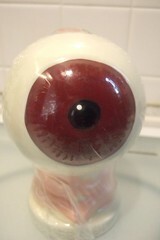 This little eyeball always calls his son, “Oi, Kitaro” with high pitch voice. Since Sakaiminato is the home town of Mizuki Shigeru, author of Kitaro, (Mike, Kitaro is not the creation of Miyazaki! ), the city’s biggest tourist attraction is Kitaro. As soon as you get there, you will see Medama Oyaji taxis, Kitaro shops and statues everywhere–Even a Kitaro ferryboat and Kitaro JR trains. In the main tourist area, the Mizuki Shigeru Road, you see stores and barbers selling all kinds of Kitaro goods. I said barbers because we spotted five or so in five blocks and they all sell some Kitaro goods, oddly enough. At the Chiyomusubi shop in front of the brewery, they sell Kitaro character sake. There’s one item I always wanted to buy ever since I spotted it in their catalog. Bingo! 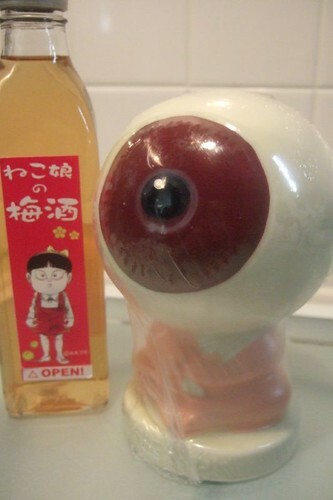 I cast my eye upon the Medama Oyaji bottle. I didn’t care how hard it would be to pour sake out of this completely round bottle, but I wanted it. 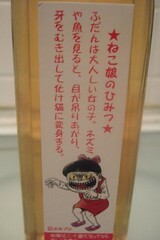 While I was visiting the kura, Matsumura-san was explaining why they put out the warning not to leave Medama Oyaji Shochu bottles in a car, then told me about this interesting umeshu bottle labeled with Neko Musume. Neko Musume is a cute girl, but she transforms and craws when she is angry or hungry. Well, don’t we all have this natural transformation? 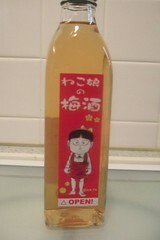 Anyway, this Chiyomusubi umeshu label shows a cute Neko Musume, but if you peel the label, you will find her real self. My sake geek side gave in to these silly Kitaro bottles, but no tasting of what’s in these bottles just yet. They are so funny! I love that Chiyomusubi has such a great sense of humor, in addition to making awesome sake. By the way, I was rather touched by your “love letter” post last time. You are too cute. It’s been a terribly busy month already, but I hope we can get together soon. We still have 3 mystery sake bottles to taste! Aren’t they good? I really love their stuff.